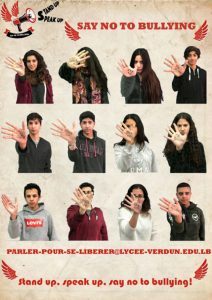 Lycée franco-libanais Verdun > Informations > Évènement > Les élèves de 2nde C se mobilisent contre le bullying ! Les élèves de 2nde C se mobilisent contre le bullying ! 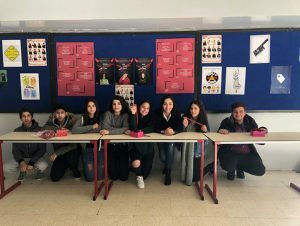 Dans le cadre du cours d’anglais la classe a mené une grande campagne anti-bullying. Les élèves ont été amenés à réaliser des affiches ainsi qu’une vidéo. Ils ont également tenu un stand dans la cour durant une récréation pour interpeller les collégiens sur ce problème. Enfin, la classe est à l’origine de la création d’une adresse mail où les élèves victime de harcèlement peuvent demander de l’aide d’un adulte. Leur objectif : Plus aucun élève victime de moqueries, de mépris ou de harcèlement. 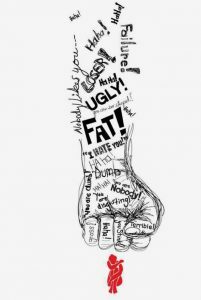 Bullying is a major issue that occurs to everyone whether it’s about your race, your origins, your religion, your physical appearance, or even a false rumor spread by an anonymous person to tear your reputation to pieces. Bullying can be inflicted in many ways like verbal, physical and even with the ride of social networking, cyber. 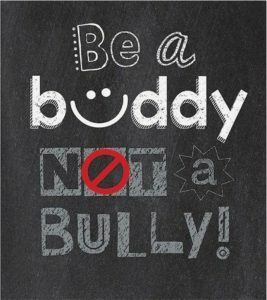 Many students from around the world had previous experiences with bullying and every single one wished if anyone would have helped them out of this severe situation. Serious suffering and depression were the main consequences on those being bullied. These facts have motivated our 2nde Students, class C, and their English teacher, Mrs. Sari Chall to take action and start an Anti-Bullying Campaign. After long hours of hard work and contemplating our students finalized our slogan and it happened to be one of the most influential in this school. “stand up, speak up, say no to bullying!” this slogan lights up a topic not much talked about when we discuss the resolutions of bullying and its standing up, for yourself, for your friend, or even for someone you just found out was being bullied. Standing up against a bully is the only way to make him feel weak and being dominated which is not the usual scenario for most of them.
. Talking about this topic with someone is truly difficult so our 2nde class came up with a way to have anyone talk and ask for help, an anonymous email! 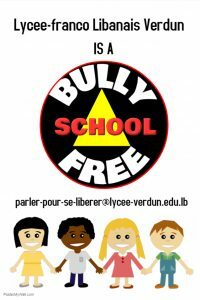 Now, Professionals take control of this email (parler-pour-se-liberer@lycee-verdun.edu.lb) and respond to all students who might have an issue to share and above all to offer them immediate help. Everyone should be able to release the chain that was once inflicted upon them against their will and everyone deserves to live a free happy life whether it’s in school or at home or even on the streets.